February 12, 2019 – There’s some good news, and some bad news. That phrase usually makes one’s stomach churn, and it wouldn’t be a surprise if this morning’s Distilled Spirits Council economic briefing in New York had some U.S. spirits industry executives reaching for the antacids at lunchtime. While there were a number of bright spots in the overall report, the impact of retaliatory tariffs on U.S. whiskey exporters had a significant impact in the final half of 2018. The European Union, Canada, Mexico, and China all imposed punitive tariffs ranging from 10 to 30 percent on Bourbon, Tennessee Whiskey, and other American-made whiskies starting in June following the Trump Administration’s decision to slap tariffs on imported steel and aluminum from those trading partners. Turkey went one step further, imposing a 140 percent tariff on all U.S.-made spirits. The result: while total U.S. spirits exports for the first eleven months of 2018 set a new record of nearly $1.7 billion dollars, the value of whiskey exports during that period actually fell slightly. In the pre-tariff period between January and the end of June, whiskey exports rose by 28 percent over the previous year to nearly $600 million. However, once the tariffs took effect, exports between July and November fell 8.2 percent from 2017 according to data from the U.S. International Trade Commission. “We’re facing the most challenging period for our exporters than probably we ever have, which has increased the amount of uncertainty for our exporters,” Christine LoCascio of the Distilled Spirits Council told reporters and analysts at the briefing, while noting that the spirits industry has been caught up in a trade dispute it had no role in creating. LoCascio acknowledged that some of the early increase may have been due to exporters shipping more whiskies in anticipation of the tariffs, but said the overall increase for the period was in line with gains from previous years. “Whiskey is so important for our exporters – it accounted for $1.1 billion worth of export sales in 2017…of that $1.1 billion, 59 percent went to the EU alone. The EU market is extremely important to our exporters, so hence the 25 percent tariff in that market on whiskey is particularly harmful,” LoCascio said. EU-bound whiskey exports grew by 17 percent between 2016 and 2017, and grew by 33 percent during the first half of 2018. However, the impact of the European tariff led to an 8.7 percent decline during the July-November period from 2017. The Council recently received a grant from the Agriculture Department to help fund additional export promotion programs as part of a federal effort to aid agriculture-based industries affected by the trade war. 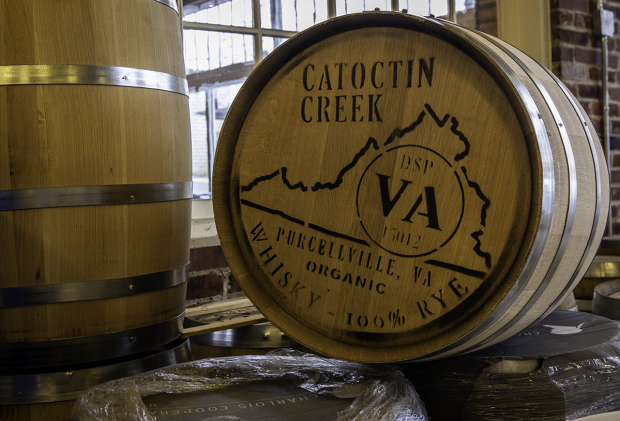 That comes as little comfort to Catoctin Creek Distillery co-founder Scott Harris, who saw export sales at his family’s Virginia distillery shrivel almost as soon as the European Union tariff took effect. Harris said their importer stopped returning their calls, let alone placing any orders for new shipments. 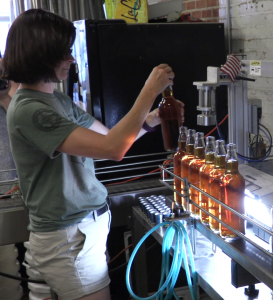 Catoctin Creek distilling co-founder and head distiller Becky Harris works the bottling line at the Purcellville, Virginia distillery. Photo ©2018, Mark Gillespie/CaskStrength Media. “When have lower sales, that affects not just our own bottom line and the families of 20 employees that we have, but also we have four farms that we source from for our rye whiskey, we have a fifth and sixth farm that are cattle farms that we give our spent mash to that offsets their cost for cattle farming. We source all of our materials for bottling in the U.S., so that means the glass coming from Anchor Hocking in western Pennsylvania, the closures coming from South Carolina, so this has an impact that spreads a lot further than just our little home town,” Harris said. The situation is brighter on the domestic side, where the overall spirits industry recorded a ninth consecutive year of gains in market share against beer and wine along with increases in both revenue and volume. Supplier revenues grew by 5.1 percent over 2017 to $27.5 billion, according to the Council’s data. Volume grew by 2.2 percent to the equivalent of 231 million nine-liter cases. The American whiskey category recorded another strong year in 2018, with gains across all price categories and a 6.6 percent increase in revenue. Bourbon, Tennessee Whiskey, and Rye all recorded sales increases, while sales of corn and so-called “white whiskey” declined. The U.S. remains one of the largest single markets for Scotch Whisky exports, and sales of both blended and single malt Scotch whiskies grew during 2018. Irish Whiskey also depends on the U.S. for a significant percentage of its overall growth, and the category grew by 10.2 in volume and 12 percent in sales – which reached $1 billion for the first time on growth in high-end sales. Canadian whisky sales were flat during the year. with a 0.3 percent increase in annual revenue of $2 billion and a decline of 1.1 percent in volume.